You can make the text for menus on your screen easier to see by making them larger while keeping your display set to its recommended resolution and default DPI. This tutorial will show you how to change the font size of text for menus to what you want for your account in Windows 10. If you change your DPI scaling level, it will also change the text size of menus to scale with the DPI setting. 1. If you haven't already, download the latest version of System Font Size Changer from WinTools. 2. Run the downloaded changesize.exe file. This is a standalone .exe file (program) that does not install anything on your system. 3. If you like, you can click/tap on Export to export your current font text size settings to a .reg file to make restoring them easy if needed. Check or uncheck Bold if you want bold text or not. Adjust the slider for the font size you want. When finished, click/tap on Apply. 1. Click/tap on the Download button in the table below for the menus text size you want, and if you want the text to be bold or not. 4. If prompted, click on Run, Yes (UAC), Yes, and OK to approve the merge. 5. Sign out and sign in to apply. Your REG file is a lifesaver. By virtue of it, I was able to apply previous Windows menu dimensions to my new Creators Edition installation. Score plus one for Brink, minus one for Microsoft. There is however, another window metric at issue. One of the entries in the erstwhile Display > Change Only the Text Size setting controlled the text size of filenames and folders in File Explorer, much less the first few entries in Chrome’s Bookmarks bar. Is it the text size for the Icons entry? It sure would be wonderful if you could provide another REG file to address that issue. And, thanks again for all of your excellent guidance over the years. Last edited by Apachegila; 18 Apr 2017 at 12:11. You're correct. It would be the change text size of icons for the other items you wanted to change. I use text size of 24 in Windows 7. 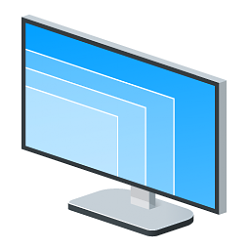 Is the size (24) in Windows 7 the same size (24) in Windows 10? Knowing this would save me a lot of testing. It should be, but there has been a lot of DPI changes made in W10 that could affect it. You could start at 24, and go from there based on what you're seeing to help reduce testing. I have been doing some color changes. What a mess compared to W-7. Well I found the problem with BSOD and fixed it. I changed my font size to 24 Bold and my screen from 1920 X 1080 to 1768 X 992 and I now longer have to squint. Microsoft sure made it more difficult to do something so simple. I wounder what people do that don't read this forum. I'm glad you got it all sorted Jack. I do desktop publishing, so displaying everything at 125% of normal is a horrible option. Work in a large, locked-down computer environment, and can guarantee our IT people will never go for downloaded Reg files, so will have to figure out some other way. Also, when it first affected my own computer at home, Microsoft told me just to live with it; they would never recommend third-party downloads, and the person I spoke with even hinted that they might contain Russian hacks. I hope that was his idea of a joke... How this new build of Windows 10 can be 508-compliant is beyond me. Windows does not allow me to change only text size on my desktop, menus etc. Only I can do is to change size of everything (taskbar, icons) which is not what i want. Is there any way to change only text size?